Every year, Pro Wrestling Illustrated calls on me for their PWI Annual. Basically, I create 12 full page cartoons illustrating the "big story" from each month of the preceding year. The issue covering 2007 should be hitting newsstands any day now. One of the highlights of January, was The Undertaker winning the Royal Rumble. 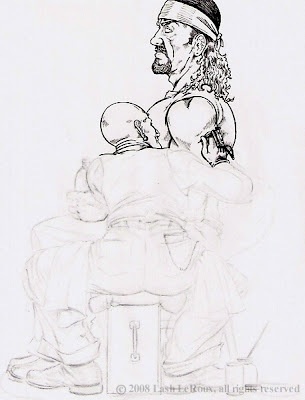 As an homage to the great Norman Rockwell and his painting "The Tattooist", I drew The Undertaker having his opponents names tattooed on his arm and subsequently crossed out. I thought it might be fun to give a little glimpse of my work in progress. So, I've posting some images of the illustration from the initial sketch phase through some of the color work. I'll post the final artwork once this issue hits the bookstores.